After a long day at a boring job, it’s only natural to want to do something that really energizes you, like cooking, painting, working on your novel, or risking your life in a dungeon full of poisonous slimes and sentient statues. Moonlighter lets players tackle both the day job and the daring dungeon delve side of that equation. It’s a fun, charming game that can eat up hours in the blink of an eye, but eventually repeats itself a bit too frequently without having much to say. First released in May of this year for basically everything except the Nintendo Switch, Moonlighter combines a shopkeeping sim with a rogue-lite dungeon crawler, mostly successfully. Its Switch release enables portable play, which is a perfect fit for basic gameplay conceit: bouncing back and forth between short rounds of dungeoneering and retailing. The game feels great in both handheld and docked mode, though the former gives you a better opportunity to appreciate the little graphical details that really make its world pop, from the changing color of light through your shop’s window as the day passes to the bric-a-brac that litters both the town and the dungeons. However, this port lacks a few updates that have since come to other versions, which add multiple save slots, a new game plus mode, and several other improvements. We’ve reached out to developer Digital Sun to find out when we can expect those enhancements on the Switch. In Moonlighter, you play as Will, a shopkeeper in the village of Rynoka who dreams of leaving his mercantile days behind to brave the walled-off dungeons on the edge of town. But the dungeons are full of creatures eager to take a bite out of Will, which forces him — and the game — into an unending cycle: Gather as much loot as possible from the dungeon, sell it back at the shop, use the profits to buy weapons and armor, and use that gear to get farther into the depths. It’s a satisfying cycle, at least for a while. In the dungeon, the game’s only verb is “fight.” The dungeon is randomly generated each time you enter and rooms are laid out in a grid, 2D Legend of Zelda-style. There’s no mapping or exploration to do there, unless you count a few hidden rooms, which are always found in the exact same way. Your goal is always to either mindlessly kill monsters for the valuable items they carry, or find your way to the dungeon’s third floor to fight its boss and gain access to the next dungeon. Journals and notes left by the adventurers who’ve plumbed the dungeons’ depths before you arrived provide a light narrative, but they never really add up to much aside from occasional navigational hints. Combat itself is decent, but extremely limited. You have access to a small arsenal of swords, spears, bows, and other standard RPG weapons that all handle slightly differently: fist weapons are fast but relatively weak, while spears let you keep your distance from enemies. They also come with a unique alternate attack: a block with the sword and shield, or a charged piercing shot from the bow. Beyond that, combat is all about timing. Your attacks have a slight delay and enemies are often too fast to allow more than one hit at a time, so fighting effectively means using positioning to your advantage, getting a quick swipe in, then dodging away before the counterattack. It’s a system that keeps you on your toes and virtually guarantees that you’ll take a good amount of damage when you’re vastly outnumbered, as you often are. It rewards skillful play without ever making you feel invincible. And if you fall in battle, you’ll lose most of the loot you’ve collected in that run, so tension always runs high. If you make it out alive, however, you can sell that loot to fund further adventures. 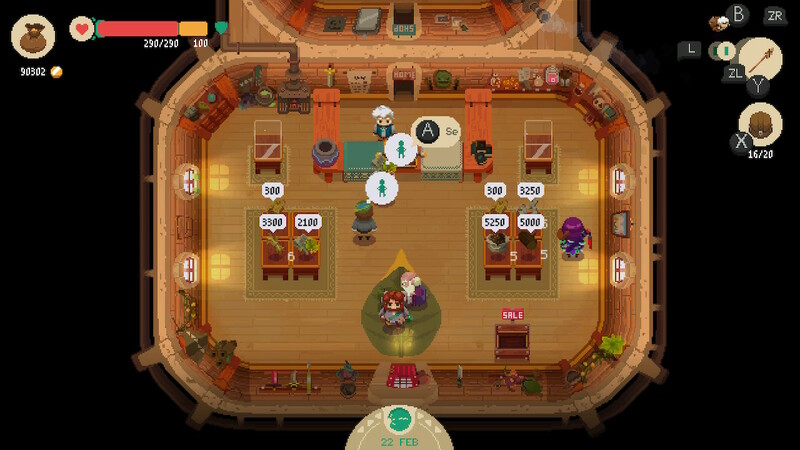 The shopkeeping sim of Moonlighter is much like the dungeon-crawling side: fun, but fairly shallow. After opening your shop, you arrange items on shelves, stick a price tag on them, and wait for customers to scoop them up. When a customer looks at an item, you can tell by their expression (rendered emoji-like above their head) whether it’s priced too low, too high, or just right. You can use these reactions to triangulate the perfect price for each item, nudging it a little higher when it gets popular, or a little lower if you’ve oversaturated the market or just need to dump a couple dozen crystals that are taking up space in your inventory. As you progress, you can expand your store, adding discount bins, decorations to influence customer behavior, and glass cases that increase an item’s demand and thwart thieves. You can even start taking on quests from customers looking for specific items, and become one of those all-important job creators that we’ve heard must be protected at all costs by employing an assistant to run the shop when you’re out in the dungeon knee-deep in slimes. Of course, Will is only a shopkeeper out of necessity, and the point of all this haggling is to buy pointier swords and bigger shoulder pads in order to take on tougher monsters. And here’s where things begin to break down, because while this is a satisfying way to make progress for the game’s first couple of dungeons, it wears incredibly thin by the end. When you’re scouring dungeons for a few particular items to make your next spear just so you can advance, combat starts to become a drag, and manning the shop because you absolutely need to make another 50,000 gold today feels torturous. It begins to mirror a phenomenon all too familiar to many of us: the blurring line between joy and obligation that comes when you try to use your passion to pay the bills. Then when you’re geared up and just want to fight the area’s boss, slogging through three floors worth of enemies also feels like a chore. The bosses are interesting, both visually and mechanically, but they don’t really put up much of a fight. The last two in particular are absolute pushovers when compared to what came before. So if defeating the big bad at the end of each dungeon isn’t as tough as getting to them in the first place and only opens the door to the next one, it raises the question, what is all this for? The game will tell you, through Rynoka’s village elder constantly chastising Will, that he’s doing it all out of curiosity. Curiosity, ostensibly, about what lies behind the mysterious 5th Door, the entrance to a wing of the dungeon that’s never been opened before. But the game has also gone out of its way to tell us that these dungeons are all the same, that every one consists of three floors and a boss, and that they all exist explicitly to be pillaged. So what could Will possibly expect to find behind that door but more murder and plunder? It’s not that curiosity is a terrible motivation on its own, but Will, a silent protagonist, is a complete cypher. We’ll never know what drives his curiosity, or if that’s what’s even driving him at all. We’re told that he wants to escape the drudgery of a mercantile life, but he escapes instead into the drudgery of endless slaughter and acquisition. In a way, it would be more satisfying if it were something as simple as greed driving him, if he raided the dungeons just to fill his pockets. It would make Will somewhat monstrous, but it would at least be something. As it is, Moonlighter never makes a strong enough case for what Will is escaping to or from. Rynoka seems like a perfectly nice place full of cheerful adventurers and happily barking dogs; its buildings are charming and a pleasant tune is always wafting through the air. Any hint of what Will longs for would go a long way toward making his ultimately circular journey feel more satisfying. When Will finally sates his curiosity and opens that final door, it’s a let down. It contains a fairly out-of-left-field twist that explains where the dungeons came from and a lackluster boss fight. Once that’s done, the game quickly wraps up and spits you out back in the village. You’re free to fight your way back through the dungeons again, but there’s no reason for doing so unless you want to finish buying any upgrades you didn’t get the first time around. In a way, the ending is Will’s worst nightmare. We’re told he has the heart of an adventurer, that he wants to discover things no one has ever seen and solve seemingly unanswerable mysteries. But in the end, he’s left with nothing but repetition and care of the shop that he’s worked so hard to escape. Moonlighter lays all the groundwork it would need to make any point it wanted — about the tragedy of having to endure dullness to fund your true ambitions, or the possibility of finding joy in rote work, about the dangers of unending consumption and the lengths it will drive you to, about how chasing your dreams can lead you to ruin or benefit an entire community around you — the trouble is, it doesn’t seem to have a point to make. Moonlighter’s original conceit blends shopkeeping with monster-slaying in a way that’s satisfying for most of its length. While both its combat and trading eventually get repetitive, the gorgeous graphics and pixel art make it a pleasant journey while it lasts. Unfortunately, your character’s quest comes to feel as shallow as the merchant’s life he wants to escape with its uninteresting goal and uninspired conclusion.